The following script fetches structre form PDB and automatically annotates the protein subunits from according to Uniport identifier in PyMol. contact = "" # Please set your email address here to help us debug in case of problems. This script colours the subnit of PDB structures based on protein abundance as determined by proteomics. 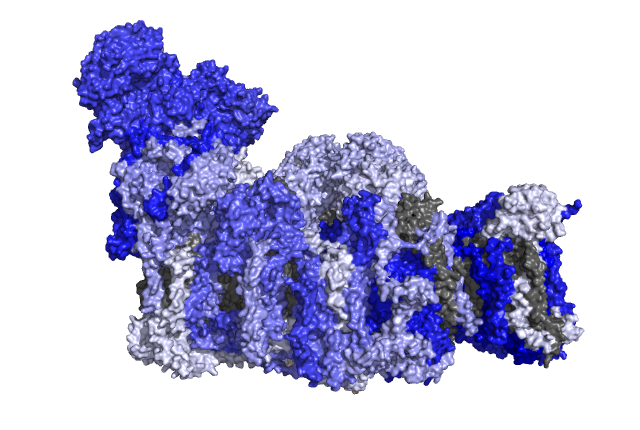 ### the color of chains (subunits) in a PDB structure. ###    identifier for each column (i.e. the knockout in the above manuscript). ###    defined by the PDB. e.g. for 5LDW: "set_name MT-ND3, chain A". ###          view, background color or transparency etc. ### and count< to one number higher than that. selectString = selectString + "|'" + chain + "'"
### to be ray traced or not (0=no, 1=yes).